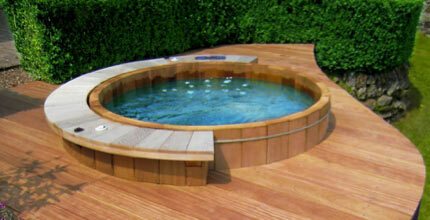 Find out how to install hot tubs, garden spas and Jacuzzi’s in your garden. We explain the whole process, including the regulations and planning considerations to selecting the site and preparing it for your hot tub or spa. We explain the electrical connections that you will need and how to go about getting them connected safely and legally. We also explain the benefits of hydro therapy and why a hot tub or spa would improve your life! This is the complete guide to installing spas and hot tubs in your garden. Having a hot tub or spa in your home can be fantastic, and we cover some of the benefits of hydrotherapy below, but how do you get it there? This is the guide to installing a hot tub in your garden. Even if you’re not planning to do the work yourself, there is a fair bit to think about to get that tub bubbling away in that favourite corner of the garden. 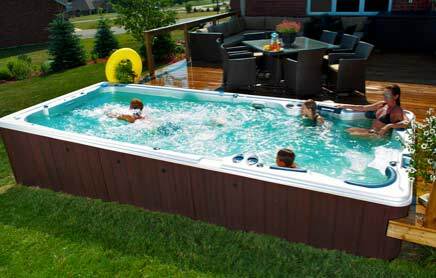 Being fairly large, typically hot tubs are installed outside, where people have more room. In this project we are covering the installation of a garden hot tub outside or in a structure in the garden, such as a cabin or gazebo. What is a Hot Tub, Spa and Jacuzzi? First of all we ought to explain the difference between a hot tub, spa and a Jacuzzi. In actual fact there is not hard and fast distinction, so much so that the same guidelines apply whichever you are installing, so we’ll use the terms interchangeably here. A hot tub more commonly refers to a tub, usually wooden, which does not have jets and blowers. A spa will have jets which mix air and water to produce a massaging effect, and they tend to be made of moulded plastic. 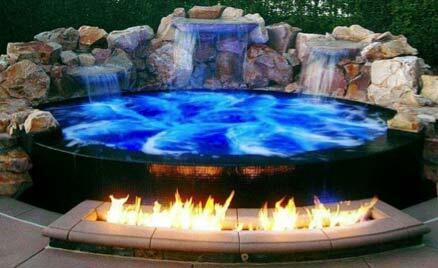 Jacuzzi and Whirlpool are brand names that have become used to describe a spa, more typically. Below we describe some of the benefits you can get from the sort of hydrotherapy that you can get from a garden spa. The first thing that you need to do is check that you don’t need planning permission. In most cases it will not be necessary, but if you are in a listed building, conservation area or Area of Outstanding Natural Beauty you will almost certainly need planning permission. A quick call to the planning office will never be a waste of time; you can find your local planning authority details at the Planning Portal. Remember also that even if your hot tub of garden spa itself doesn’t need planning permission you might need permission for the building that you may create to put it in. Cabins, canopies and gazebos will all be subject to the planning rules. Thankfully many of these things, if within the deemed dimensions, will qualify as permitted developments, which you can read more about here. When it comes to building regulations itself, it is also unlikely that you will need to refer to building control, but this will depend on the size of the hot tub you choose and the location and structure that you might choose to put it in. For example, any outdoor structure with a floor space of over 30 sq m will require building regulations approval, regardless if there are walls or not. 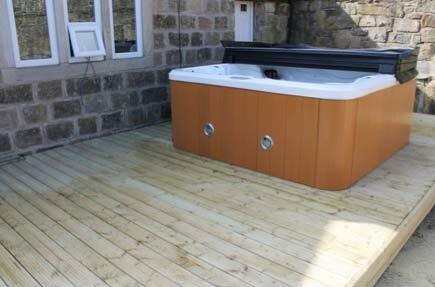 Remember that you will need to have hot and cold water, waste water and electricity to your hot tub site. All these will need to comply with the current rules and regulations. You will need a competent person (qualified electrician) to sign off the wiring as this is not a DIY job. We will cover this in more depth below as this is very important to get right. We’ve briefly touched on this already, but you will need to get water and electricity to your spa or hot tub and you will need to get the waste water removed. Positioning the hot tub in the most remote corner of the garden is not going to make this easy. 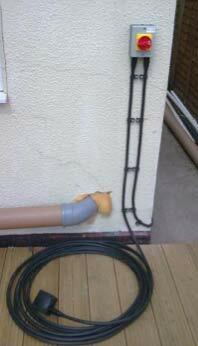 A position relatively near the house will always make the installation easier and ultimately cheaper. It is important that you have level ground to put your hot tub on. We will cover how to build the base for the tub in more detail below, but once built it does have to be level, so positioning it on a precipitous slope, despite the jaw dropping view, might prove problematical! Also consider your convenience when it comes to using the tub. You probably want to be quite close to the house so you can get to it easily or you if you forget something it is not a marathon to go back and get it. You’ll probably need to build a path to it so that you can get there easily. If you’re lucky enough to have a pool, you might consider sighting your hot tub nearby so you can enjoy both, and use the utilities which will be run to the pool. As with anything outside its use and your enjoyment is so dependent on the weather. It is worth trying to find a sheltered spot out of the wind but which gets the sun particularly for the time of day that you are most likely to be using the tub. A south facing position is usually best. It is easier to build a canopy or cut back over hanging branches than it is to move the hot tub once you have put it in place. You can easily build a fence to shelter a position if required. It is worth considering your neighbours when you are choosing where you put your spa or hot tub. Not only do you probably not want them over hearing your hot tub gossip, it would be considerate to try to site it in a position that will not disturb them if at all possible. What goes on in your hot tub is your business, and it is worth finding a spot that will keep it this way. You can always build a canopy or plant plants in a way that will make the location more private. It is important to consider safety when sighting the hot tub, particularly if you have or are likely to have children in your garden. The last thing you want is some little person to climb in while it is unattended. Think also about your access and whether you can get in and out safely. Make sure that you have sufficient hand rails and a sturdy platform to get in and out of the tub from. 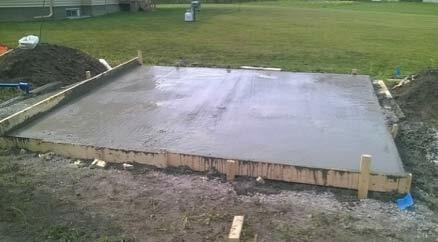 Once you have found the spot to put your hot tub or spa you will need to prepare the base. This will generally be your responsibility even if you are getting your supplier to fit the tub. They will expect the location to be prepared ready for when they deliver it. There are only two critical things to remember when it comes to building your base; hot tubs are heavy and they must be level. The base you prepare must be level and sufficiently strong to support the weight which will be at least 1.5 tonnes and possibly more. You will need to consult the specifications of your chosen tub, or speak to your sales person to confirm this. 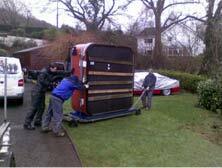 The base needs to be big enough to accommodate the hot tub, heat pump and utilities required to work it. Consider also space for you to access the hot tub as you don’t want to be climbing in directly from your lawn. It is possible to sink the tub into a hole in the ground. While the principles are essentially the same, this requires more effort to dig out the hole and run in the utilities. Typically the tub is placed on a base at ground level. This is the most solid and durable solution. If the bottom of the tub is undulating you might need to lay some sand on the concrete base to support the tub better. To build your base you need to follow the instructions as if you were building a shed base. The thickness will depend on the size and weight of the hot tub or spa that will sit on it, but somewhere between 4 and 6 inches is normal. This is essentially like creating a patio onto which you can place your hot tub. Find out here how to lay a paving slab base. This is the more difficult option, not because it is hard to lay decking but because of the weight and forces that are involved which your deck will have to support. It is vital that you check the requirements with the supplier and if you are unsure about how to sufficiently strengthen your decking, seek professional assistance. You can find out how to build decking here is this is your preferred option. It is possible to purchase interlocking pads which can be used to quickly and simply make a base. These are not as secure as a permanent solution, but are ideal for portable spa. It is possible to place your spa on to a gravel base, which has the benefit of absorbing any splashes. The weight of the tub will keep it secure, but clearly this is not as permanent a solution as a solid concrete base. The way to build this is the same process as you would follow to build a gravel drive or pathway. While you have the tools out you should consider building any area you might need to access the hot tub or spa and the pathway to get to it. This will be much easier to do now rather than later when the tub is in place. 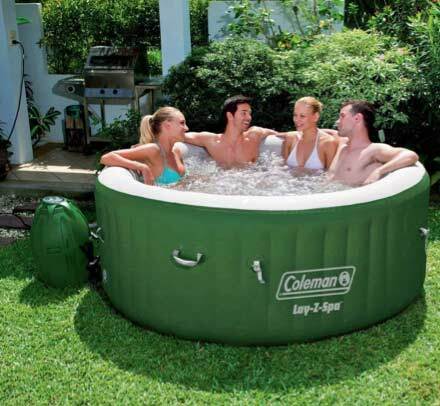 A hot tub, even when empty, can be very heavy and extremely cumbersome. Getting this to that private spot at the back of your garden can be challenging, so it is important to know what help the delivery driver will give you. Some suppliers will be able to provide a trolley to assist you, but you will need to ensure that it can be wheeled and there are no obstacles. You might need to remove a fence panel or two to get it into position, for instance. Worst case, you might need to consider hiring a crane to get it into place. Have this conversation with your salesman, rather than having your prized new hot tub sitting on the pavement outside your front door until you can organise a way to move it! We have already covered the planning requirements and building regulations approvals. The most important aspect of your hot tub installation is to ensure that the electrical installation complies with Part P of the building regulations. Essentially, it is your responsibility as the homeowner to ensure that you have a certificate at the end of the insulation from a qualified electrician stating that the insulation has been tested and certified safe. In practice this means that you need to get an electrician to do this for you, but it does not stop you understand exactly what needs to be done. 13 amps is the minimum supply for hot tubs and spas so would only apply to smaller hot tubs and spas. These can be plugged directly into a normal 3 pin socket. The socket should be an outdoor 13 amp socket protected by an RCD. Before the electrician leaves makes sure that the tub is filled and tested. You want to make sure that everything is working properly and the installation is to your satisfaction. Many hot tubs will have a ‘commissioning’ process to ensure that the installation is as it should be, and to make to familiar with the basic functionality of your new tub. 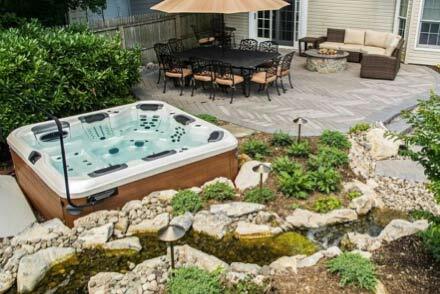 There is a level of maintenance required once you have installed your new spa or hot tub. This will depend on the model so always follow the manufacturer’s guidelines. Complete water change – drain and refill. As we mentioned, there is cleaning and maintenance to be done which we wanted to highlight. Beyond that this will vary hugely depending on the model. Stresses and strains from everyday living can cause muscle tension and restricted blood flow, giving rise to tiredness and headaches. These in turn can affect our moods and thoughts. Spaform has teamed up with medical researchers to look into the positive effects that regular use of a spa can have. Bathing in hot water causes blood vessels to dilate, improving circulation and increasing cardiac output (without extra stress being placed on the heart). There is an overall increase of fluid in the body, indicating that toxins surrounding injuries and excess fluid in joints are returned to the blood stream. This would relieve symptoms for sufferers of rheumatism and arthritis. Immersion in water and the resulting buoyancy reduces body weight by 90%, taking the pressure off aching joints and tired muscles. This muscular relaxation augments the dilation of arteries and the benefits of improved circulation as well as improving joint mobility. The most important aspect of a spa is its ability to provide hydro-massage. Created by a mixture of air and water pumped at pressure through “vibro” and “pulse” jets combine to provide the ultimate in hydrotherapy. Muscle tension is relieved and the body’s natural healing process is stimulated through the ancient art of massage. As well as the physical benefits that a spa can provide, the increase in fluids dilutes the amount of “stress hormones” in the blood, including nor adrenalin, helping you to forget the stresses of the day and bringing you into a state of calm relaxation.